stature and regality of other lighthouses in along the Hudson. However, what it may lack in grandiosity it more than makes up for in historical significance. It's the Stony Point Lighthouse in Stony Point, New York, the oldest Hudson River Lighthouse. Visiting it makes for a fantastic day trip. A sightseer not only gets to experience an important piece of maritime history, but also an often overlooked moment in early American history. 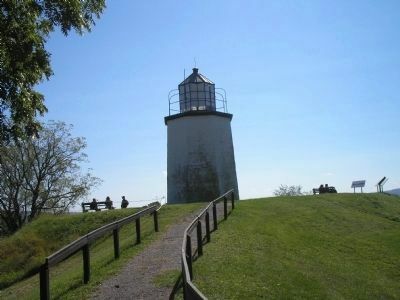 The lighthouse stands on the Stony Point Battlefield Historic Site, which is operated by the State of New York. The Battle of Stony Point took place in July of 1779 and was an important American victory. The Hudson was then, as it remains now, a vital thoroughfare and control of it was crucial to the outcome of the Revolutionary War. A group of American soldiers defeated the British who had set up a garrison there, ensuring that the British would not have control over the river. The lighthouse was built on the site in 1826 and remained in active service until 1925. During that period there were some eight different lighthouse keepers who diligently stood watch over the Hudson, making sure that mariners safely navigated the waters of the mighty river. In that period there was in fact only one vessel that ever ran aground, the steamer Poughkeepsie in 1901. However, thankfully there was no loss of life resulting from the catastrophe. Following the lighthouse's decommissioning in 1925, the light tower remained manually operated until 1973, when the United States Coast Guard automated it. The lighthouse opened to the public in October of 1995. In addition to spectacular views of the Hudson and Hudson Valley that visitors will experience by visiting the site, they will also be treated to a museum on both the history of lighthouse and the Battle of Stony Point. Furthermore, there are costumed Revolutionary War re-enactors who drill in period costume, much to the delight of all. it, standing just to the east. For more information and hours of operation interested parties should call 845-786-2521.